I have gone blusher crazy this year and I seem to have way too many similar shades - yet I still go ahead and buy some more! But coming back home for the weekend meant that I could only pick up a few to take me with me and I decided to go for 3 of my go-to blushers at the moment. All three of them are classed as drugstore/highstreet brands, but not all can be found in the UK highstreet shops. I will leave the links to the easiest ways to purchase them for you. 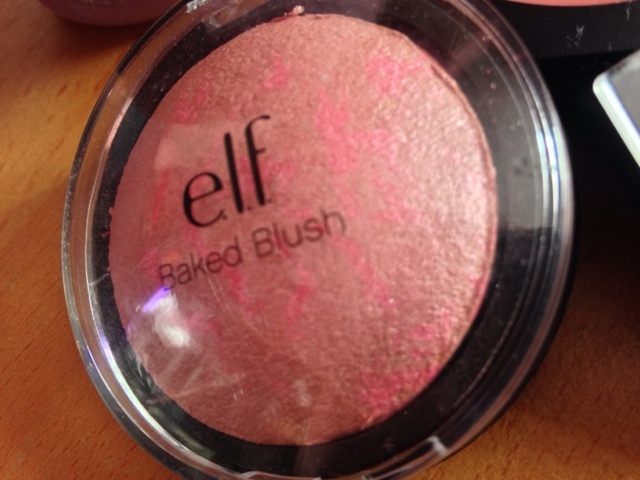 The first blusher is a fairly recent purchase that I got from e.l.f. cosmetics (see the post here). I have so many of the studio line blushers but I thought I would try out the baked blush range (£3.95) as I've never really tried a baked blush before. I got the shade Passion Pink, which I absolutely love, it has swirls of a fairly bright pink surrounded by a slightly shimmery mauvey-pink. The shimmer isn't too overpowering so it is easily wearable during the day. The packaging could do with a little improvement but hey, if the product is good who cares about the packaging! I then decided to take with me a blush that I love but for some reason don't reach for as much. 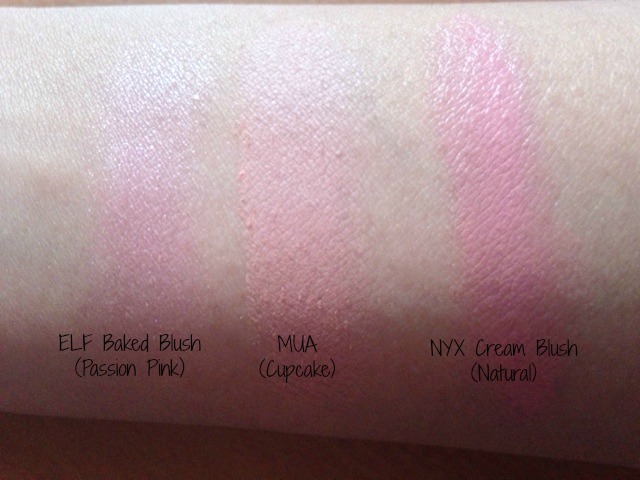 It is the MUA blusher in the shade Cupcake - how adorable! I have the shade bon bon which I do think I prefer, however this is a nice subtle colour that adds just a tad bit of colour to my cheeks. As a girl with medium toned skin, the colour isn't as pigmented on me as some of my other blushers, but I do like to wear it when I have gone quite heavy on contouring and bronzing, or if I'm wearing a bold lip colour as I don't like to have too many things going on at once. It's a nice soft formula that doesn't cake up on the skin but doesn't leave much of a dewy finish. It is just the right consistency. And if you're on a budget then this is perfect for you because it is only £1! 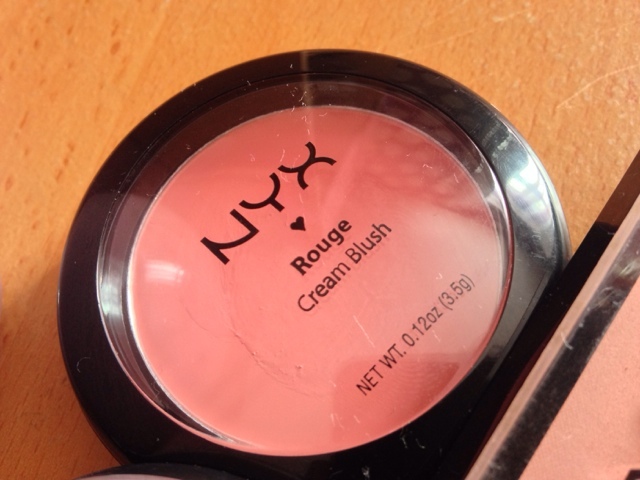 Lastly, is another recent purchase from NYX cosmetics (haul post here) and it is my first Cream Blush (£5.50) in the shade Natural. Despite the shade name, the colour is actually quite a pinky shade but a very wearable one. I cannot believe how much I love the formula, it is so smooth and easy to blend on the skin. It leaves a very slight dewy effect but nothing that looks unnatural. It's also extremely pigmented and a little definitely goes a long way. This blush wins best packaging out of the three, it reminds me of the mac packaging. 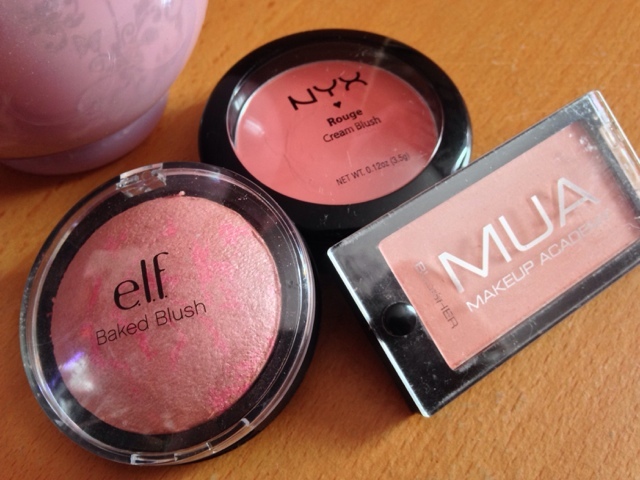 I love all three of these blushers and I am definitely looking to try out some new shades in the near future! If you have any shade recommendations then please let me know in the comments below!